I have spent the last week travelling in Turkmenistan, a Central Asian country wedged between Uzbekistan and Kazakhstan to the north and Iran and Afghanistan to the south. 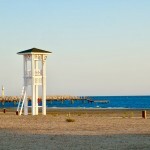 It’s landscape is made up in large part by the sandy Karakum desert but it also borders the Caspian Sea. 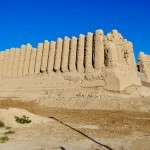 There are many thousands of years of history contained in archaeological sites sprinkled across the country- even another of Alexander the Great’s cities called Alexandria Margiana. But most of these places are crumbling ruins which require more than a little imagination to picture any of their former glory. Modern day Turkmenistan is now a strange Totalitarian Regime since the collapse of the Soviet Union. It ranks next to North Korea as one of the most repressive governments in the world on ratings of freedom of speech and freedom of the press. 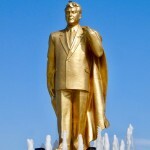 The first president who ruled until his death in 2006 renamed himself Turkmenbashi (leader of the Turkmen) and elevated himself to a state religion. He had gold statues of himself erected in every town and released a book on the correct morals and virtues of Turkmen and ‘rewrote’ favourably the history of the nation. It became compulsory reading for all citizens and people were required to recite passages from memory at job interviews and driving license tests! He required his book to be displayed with equal prominence to the Koran in mosques (a decree that led hundreds of mosques to close in protest) and built his own golden mosque and mausoleum graciously covered in quotes from his book. He even changed the offical names of the days of the week and months of the year to be renamed after himself and his family members. 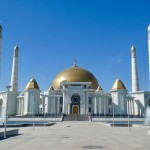 Among some of his more devastating laws included cancelling the age pension to save the government money (despite the country sitting on enormous oil and gas reserves) and closing all of the regional hospitals declaring that anyone who required medical treatment should travel to the illustrious capital Ashgabat to attend a hospital. He banned the Hippocratic oath for doctors and replaced it with the oath to the President. Instead the people got a gleaming white city. Truckloads of white marble was brought in with more than five hundred buildings constructed from marble. 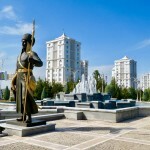 Indeed Ashgabat is in the Guinness book of world records as the most ‘marble-clad city’ in the world. The effect is like an oversized cemetery. There are manicured parks, gold lampposts and the streets are swept and washed every day. The new president shows no less eccentricity in his whims as he decided in January this year that he did not like dark coloured cars spoiling the purity of the white city. He decreed that all dark cars on the road in the capital be impounded until their owners had arranged for them to be repainted white! It’s been a fascinating glimpse of Turkmenistan both past and present. Seemingly they are a people who emerged from Soviet control to find themselves trapped in a marble birdcage. 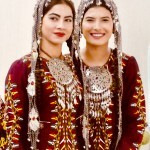 This entry was posted in Turkmenistan and tagged Ashgabat, Turkmenistan. Bookmark the permalink.